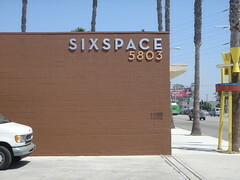 Well, after a month or so of moving and organizing and building and painting and everything else, the next sixspace location in Culver City is officially open. To celebrate, we’re having two nights of openings for Rachell Sumpter’s Seahorses Unite. Tonight – Friday, September 9 from 5-8pm & tomorrow – Saturday, September 10 from 7-10pm. As a bonus several for those heading over tonight, there are several other galleries within a block or two also having openings tonight so it should be very cool to be able to walk around and see all kinds of art. We’re excited about it anyway. The new location is 5803 Washington Blvd. in Culver City and is painfully easy to get to from the 10, Fairfax, La Cienega, Venice or really anywhere. The thing to remember is that our front door is in the back of the building, not on Washington. Hope you can make it! Next PostNext The Triathletes Are Coming! The Triathletes Are Coming!